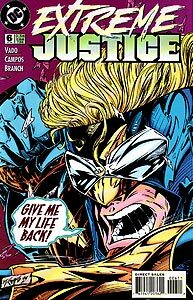 Cover Description: Fist raised, Booster Gold screams at the viewer. Brief Synopsis: In between missions, the Justice League deals with their personal lives. Issue Summary: Returned to Mount Thunder, Captain Atom confronts Maxima in an attempt to repair their relationship. Maxima agrees to rejoin the team, although she makes it clear that she views the group not as a team but as a family. Meanwhile, Oberon watches as Booster Gold uses the central computer at Mount Thunder to search for his old manager, Dirk Davis. Finding something, Booster flies away. Despite Booster's demand that Oberon not tell anyone what he has found, Oberon decides to find and tell Blue Beetle, who was working with Firestorm, that Booster has gone to Las Vegas. Booster bursts into the office of Dirk Davis and demands that Davis return his stolen fortune. Davis explains that he spent the money building Lightspeed Entertainment, a producer of multimedia entertainment. Figuring that the company was built on his stolen fortune, Booster seizes control of the company, effective immediately. Blue Beetle arrives in time to see Davis thrown out of the building. Booster immediately makes Beetle his partner. As Oberon watches, Booster Gold is using the computerized resources of the Brain in Mount Thunder in order to locate Dirk Davis. Booster has been waiting for this moment since Extreme Justice #1, when Blue Beetle suggested that the Brain was capable of tracking anyone anywhere. The disappearance of Skeets is accounted for when Booster tells Oberon that Skeets is mapping Mount Thunder. Though not shown, Skeets has apparently rejoined Booster and the Justice League following his last appearance in Extreme Justice #4. HIS STORY: Arriving in Las Vegas in search of Davis, Booster ponders how he survived the paparazzi when he was named the 2461 Quarterback of the Year. The paparazzi are photographers who specialize in taking candid shots of celebrities. They are unpopular with the celebrities themselves, especially because of the invasive techniques that they tend to adopt to get the best pictures. 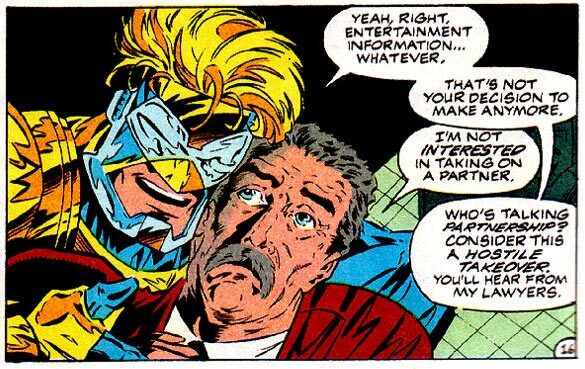 Booster Gold comes face-to-face with his old manager, Dirk Davis, for the first time since Millennium #4. Dirk was a sleeper Manhunter agent who embezzled the assets of Bosoter Gold and his corporation, BGI, Inc. At the time, Dirk had promised to return Booster's fortune if he were to join the Manhunters, though he never did. Davis has used Booster's money to found Lightspeed Entertainment, a manufacturer of "interactive multimedia entertainment and information." Booster is not pleased to hear this. He clearly has a low opinion of video games, though perhaps he shouldn't be so quick to dismiss his old manager's business acumen. As a time-traveling investor, Booster should know that by the year 2004, video game sales in America will generate a revenue in excess of six billion dollars. Under questioning, Davis admits that he lost money on a "stupid land deal in Arkansas" and a "little comic book company." The Arkansas land deal is likely a reference to the Whitewater Development Corporation, a failed (and potentially illegal) development company partially owned by future President Bill Clinton in the 1980s. Could the comic book company be Blaze Comics, the publisher of the Booster Gold comic book? After declaring himself the new Chief Executive Officer of Lightspeed Entertainment, Booster Gold has Dirk Davis thrown out of the Freeholme Building. Booster figures that if Davis founded the company with money stolen from Booster's fortune, that makes the company his. Though this argument may be valid, it is still surprising that the Lightspeed Entertainment security guards would take his word over Davis' and throw Davis out of the building. Lightspeed Entertainment is the fourth corporation owned by Booster Gold. Booster Gold immediately makes the newly arrived Blue Beetle II a partner in Lightspeed Entertainment. "Hey, we're a team. Blue and Gold - remember?" Boosterrific Review: While it's been said before, it can't be said enough that Marc Campos' art is ugly. Really, really ugly. However, Dan Vado continues to turn in interesting stories built squarely on the established continuity of his characters. In this case, Captain Atom confronts his past (future? ), and Booster Gold has the opportunity to address an outstanding personal issue that has languished since the cancellation of his own series. Fans of these characters will find enjoyment in this issue despite Campos' best efforts to ruin it.